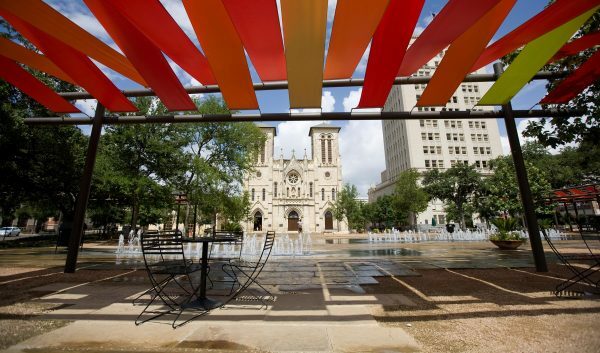 Downtown is a growing part of Houston as residents and visitors seek a vibrant pedestrian and transit-friendly environment with proximity to jobs, amenities, and high quality open space. Within Downtown, the Theater District and its many venues create a “magnetic field” of culture that generates buzz and catalyzes investment in the surrounding neighborhoods. 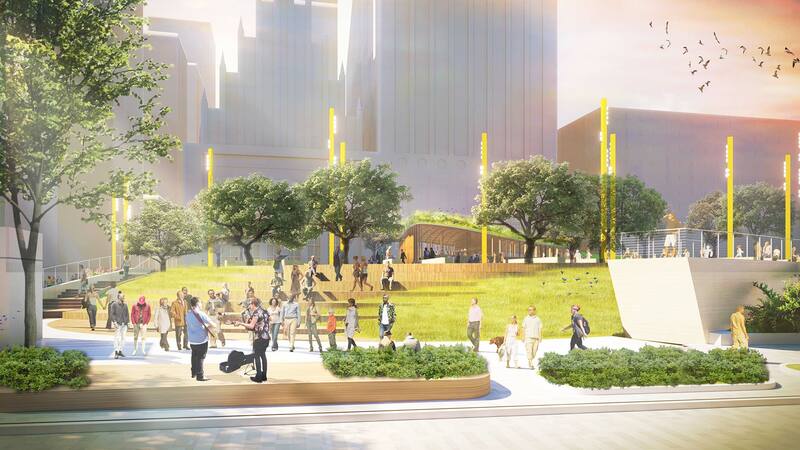 Jones Plaza, at the epicenter of the Theater District, can provide an inviting green oasis that enhances downtown life and it can flexibly accommodate a wide range of outdoor performances and special events that serve the entire region. Discovery Green anchors the east edge of Downtown and Buffalo Bayou as a complementary resource on the west edge. Jones Plaza is a jumping off point from the city to the Bayou’s open space network. At the same time, it is a gateway to the Theater District which engages this cultural context through a series of visual, physical and programmatic relationships. From the Downtown to the district to the human scale, the spaces for urban life at Jones Plaza are shaped by and reciprocally shape flows of urban life. We call this placemaking strategy Urban Choreography. 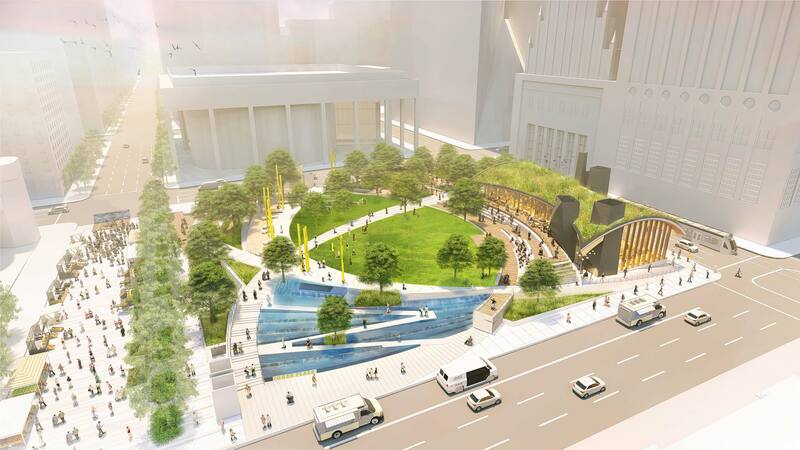 Inspired by the movements of the performing arts, these gestures connect Jones Plaza to the city and articulate diverse spaces for gathering. 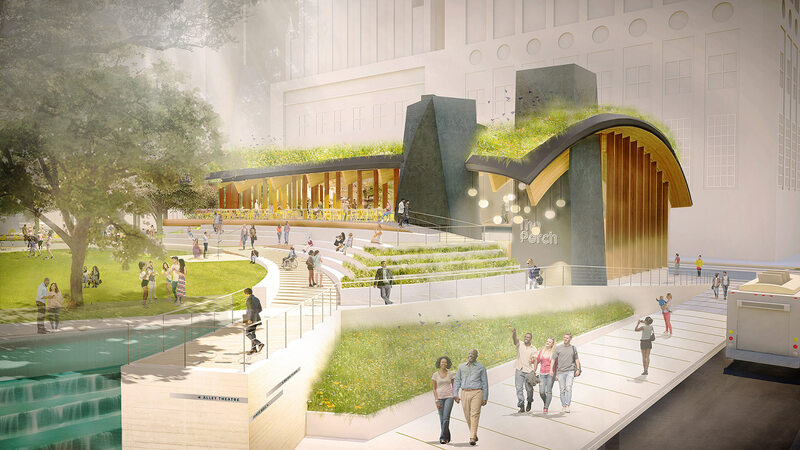 These spaces will become stages for creative discovery in partnership with the institutions of the Theater District and the citizens of Houston. 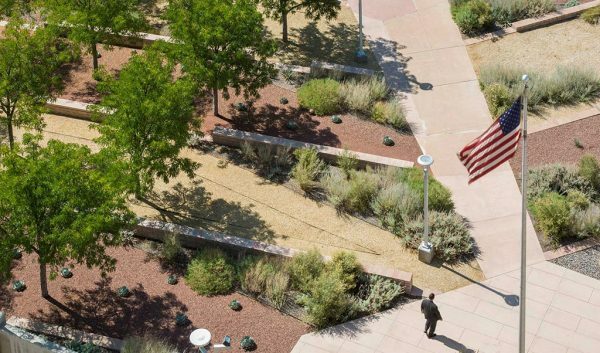 The north and south corners of Jones Plaza from Texas Avenue and Capitol Street act as important first impressions and serve as welcoming thresholds. 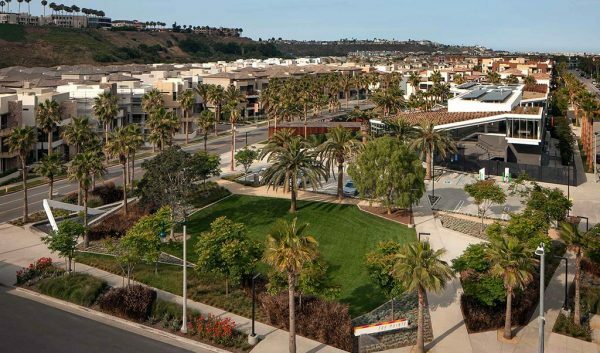 The top of the existing garage structure, requirements for planting depths to support large trees, and retention of significant existing retaining walls were all important considerations in the design process. 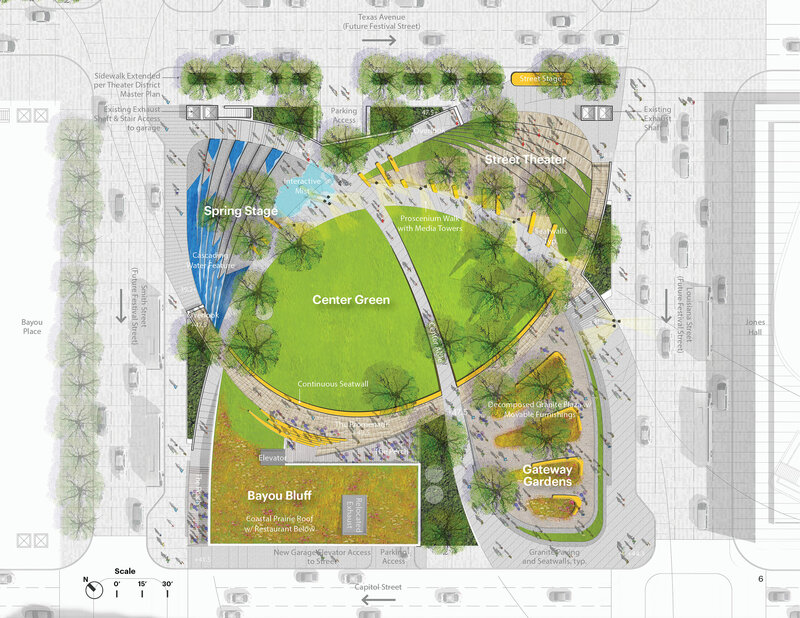 The west and east corners of Jones Plaza are configured as important areas of the park to inhabit and create spaces that are oriented both towards the surrounding streetscapes and into the park. 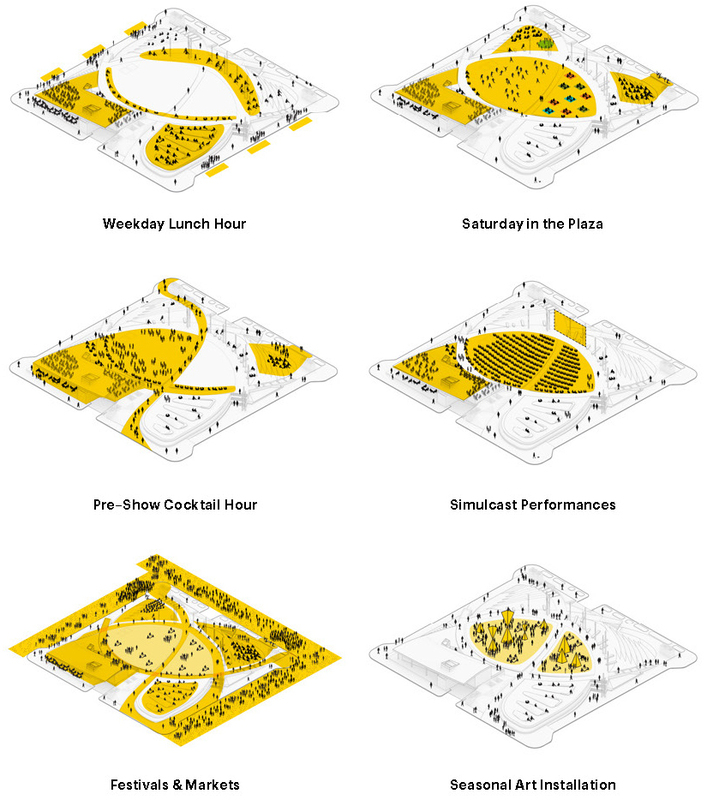 A proscenium walk, with multifunctional media towers, frames the Center Green of Jones Plaza, and allows for diverse types of uses, performances, and activities to utilize the space at a variety of scales. Jones Plaza can host smaller events in a Street Theater on the east corner. A sidewalk stage allows performers to address an audience in the wooden hillside grandstand or to face outward during street festivals. The Center Green allows large gatherings and events such as simulcast performances from nearby theaters. A graceful ring of trees, sculptural lighting and outside dining frame this flexible open space. 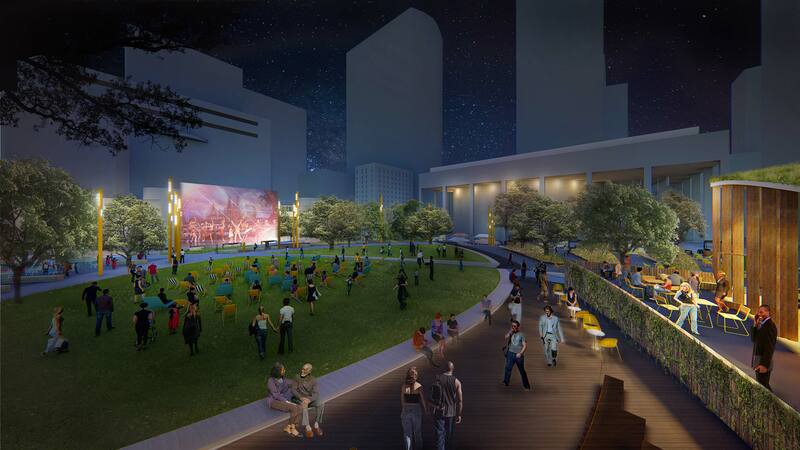 The new Jones Plaza in the Houston Theater District is a multi-use venue and open space, as denoted by the various configurations for events, festivals, and performances. 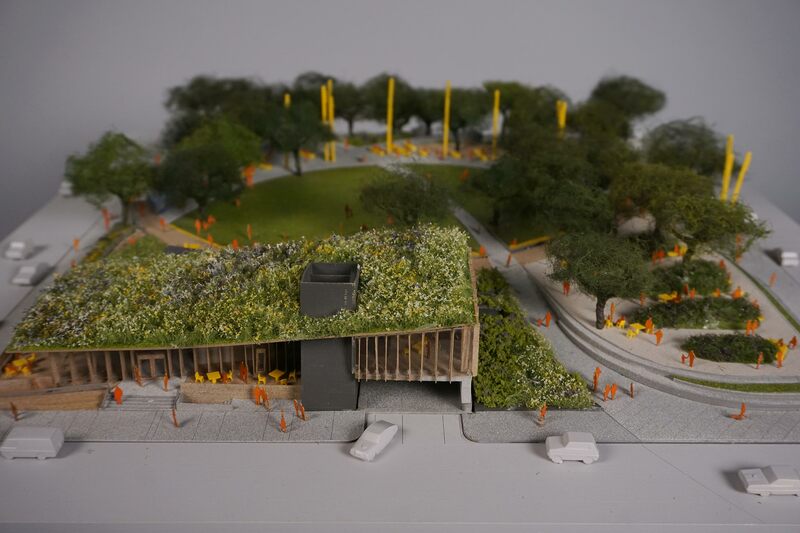 The landscape peels up at the west corner to reveal a restaurant that addresses both the park and the street. 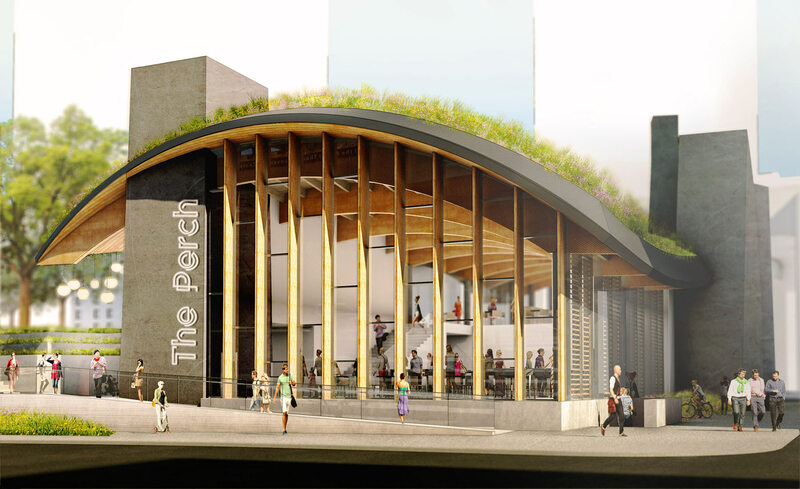 This seamless integration of site and structure keeps the attention on the park experience while attracting visitors for dining or drinks in the District. 200 indoor and 80 outdoor seats are provided on two levels with a grand stair and elevator connecting the park through the restaurant to Capitol Street. The flexible dining areas can easily be also be divided and rented. Approaching from the Westside, visitors will encounter the Spring Stage, with water cascading toward the street in the direction of the bayou. Texas Avenue can be used as a festival street linking Jones Plaza, Fish Plaza and the Bayou. 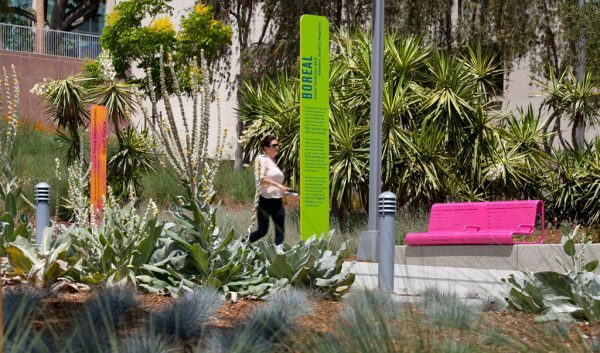 The most important impact Jones Plaza can have is attracting people to live, work, and play Downtown. 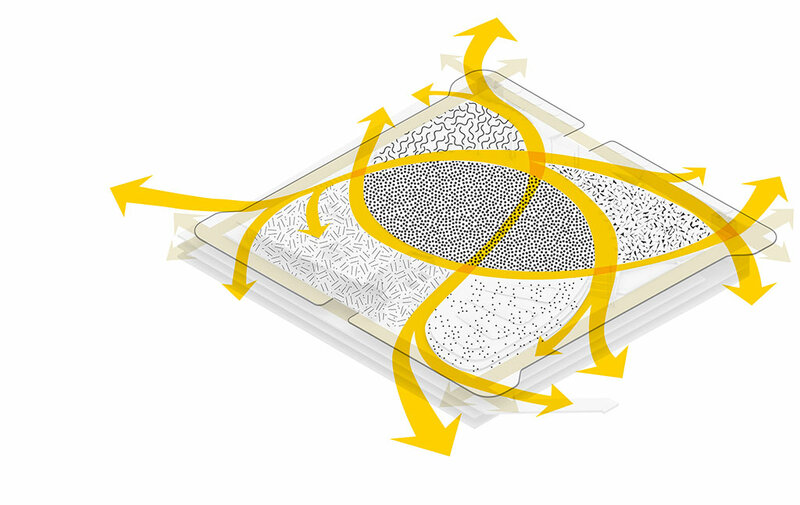 As a vibrant community resource, it can stimulate density and improve the community’s health and wellbeing. 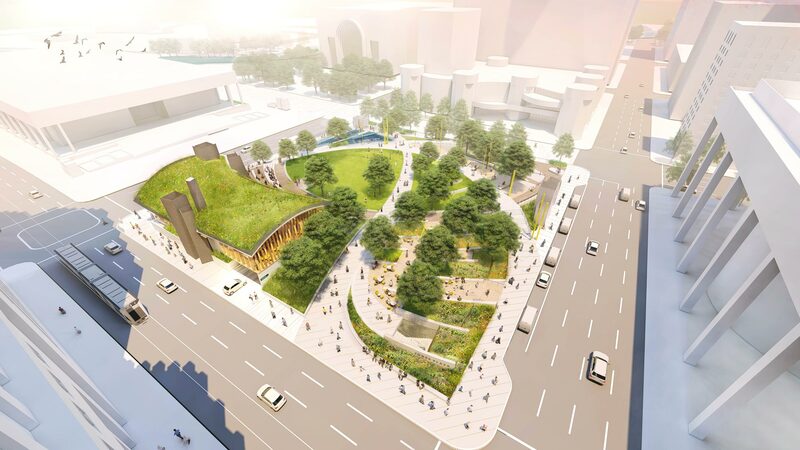 The revitalization of Jones Plaza sets the stage for activities and events that attract urban living and plaza life on a daily basis while serving the entire region with diverse cultural programming.